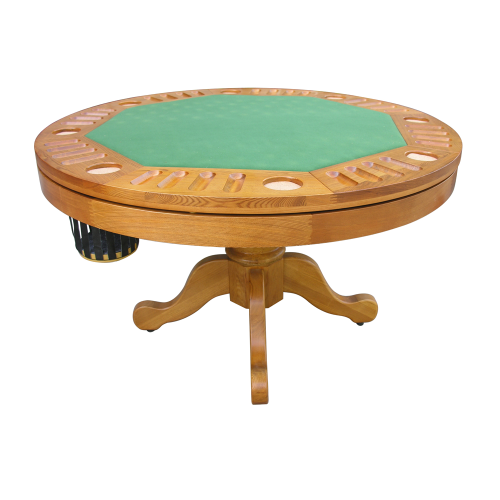 If you are serious about your poker or card games then you know it is essential to have such a table. Due to space restrictions in most homes its not possible to have a permanent Poker table. This is why our 3-in-1 table is very popular. A quality dining table that also includes a poker and pool table! Measuring 29" high and with a large diameter of 48", this table is finely crafted with a superb Oak finish so that it looks at home in the most elegant of dining rooms. You can dine at the table, then reveal to your guests afterwards the gaming functions of this table also. "Table has arrived and is in perfect condition. Very impressed with it. Assembly was simple and it looks just great. If you need someone to give a reference to a future customer just ask. Many thanks"
"A++++ Exceeded my expectations. So well made and fast delivery. Very impressed!" "Superb table delivered when said. Only problem is I now play more poker!" "Fast delivery, very helpful customer services and after sales service. 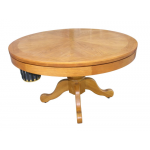 A+"
"Lovely Table and prompt response"
"Quick delivery and a quality product!" "Quality item with fast and effective service, thank you for great service." Your 3 in 1 table is as beautiful as a dining table as it is functional. In classic round design this will be the focal point of your room whether its in use or not. Whether you are just having a dinner party or dinner before the games evening this it will provide you a superb dining table. With comfortable spacing for 8 Poker players you will really feel the atmosphere when your game is running. With hand crafted areas for each player to place their drinks and chips this is the ultimate in professional style Poker. As its third function this excellent table provides a Bumper Pool table. So after the Poker is over you can wind down with a game of this fun game. What is Bumper Pool ? 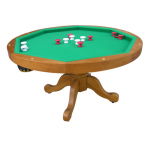 Bumper pool is a casual billiards game with two pockets on opposite ends and bumpers around the table. Two bumpers surround each pocket with the others arranged on the table's midlines leaving a space just large enough for a ball to pass through. The game is played with 5 red and 5 white balls, with one marked ball in each set. The game may be played in a much smaller room than most billiards games. POKER - Poker Table, 8 seater with drink and chip holders POOL - American style bumper pool with c..